Discussion in 'Amps and Cabs' started by Bruce85, May 8, 2016. I am getting a horrible overdriven distorted sound even at very low volumes from my 70/80 speaker in my Fender 1x12 cab. I have tried different guitars and amps etc and it still happens. Well I read your post too fast, if you already have tried different amps with that speaker, then it's definitely the speaker. Easy fix ! Can't you just take a look at the speaker cone? 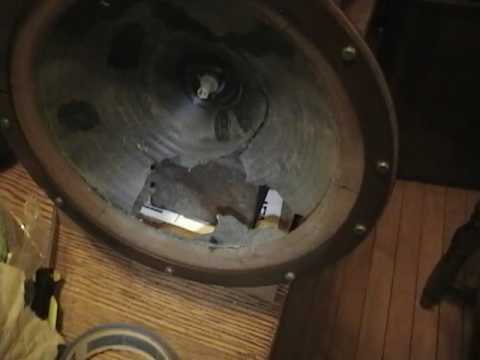 If the voice coil is the problem, and it often is, the cone will look fine. Make sure you look for loose screws around the speaker. That can cause an awful noise in some cases. This has happened to me over the years many times. Don't underestimate the sonic anarchy a loose nut can make on a vibrating speaker. Considering you can buy a 70/80 for about $25, if you are lazy, like me, just buy another one and change them. If it fixed the problem great. If not, kick the amp off a bridge. I have also noticed that regardless of what amp head I use the cab with is if I crank up the volume it makes this very loud white noise/hissing type sound. Can that be a sign of anything in particular? Seriously, our bass player noticed he had a blown driver when he started hearing a buzz on certain notes. He hasn't replaced it yet -- we just have them mic another driver. But that was the first indication he had something was wrong. I get the same from my GDEC lately, and one day I'll get another speaker to replace it, but I haven't made it a priority yet. A perfectly good speaker can develop problems if it was cranked down too hard on installation, especially stamp frame. If the frame gets bent, it can cause the speaker to rub and sometimes pull the voice coil out of alignment. If you are sure all cables are good and all connections are tight and clean, then sounds like you may need a re-cone or another speaker. That's amplification for you. If you keep playing long enough at that volume the hissing sound will fade out, eventually to be replaced by other weird noises inside your skull which won't. fyler and remocity like this. Isn't voice coil damage detected by a low distortion? Generally clear but for a very low distortion? I think I have that problem with my 1 x 12. Have to do a Davies special on it.